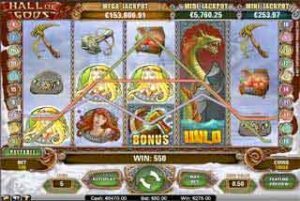 Hall of Gods is a slot machine that is played with five reels and three rows, on which a total of twenty paylines are available. The game features consist of features and in addition to being offered the opportunity to make a profit with three equal symbols, money can also be won with special bonus features. One of the special features of this slot machine is that there are three jackpots available, namely the mini jackpot, midi jackpot and the mega jackpot. These jackpots are progressive and differ in height. The biggest jackpot is the mega jackpot, which can go so far that the player who wins the jackpot can become a millionaire in one fell swoop. Click here for the Bonus Action! The coin value can thus be adjusted between the minimum and the maximum bet limit per game turn. In addition, a separate bet level is available with ten levels. The bet level is set to level one by default, but can therefore also be changed by the player. After all settings have been set as desired, the player can press the start button and the reels start spinning. If three equal symbols are linked from the left-hand reel, that produces a profit. That a winning combination of identical symbols makes money applies to every slot machine and also to Hall of Gods . What makes this slot machine special, however, are the features. For example, the terrifying dragon in the game is the wild symbol and can substitute for other symbols, but not the scatter and the bonus symbol. If there is a wild symbol on reel two, three or four, then the wild folds out over the entire reel. There is also a scatter in the form of two birds of prey depicted in front of the full moon. Three of these symbols yield 10 free spins and four scatters are good for 15 free spins. 20 free spins are awarded if five scatters appear on the reels. The win is multiplied by a factor of three. The bonus round is the most important of all features, because if you end up as a player there is a chance of winning one of the three jackpots. The bonus symbol consists of a shield with a hammer and if three of them appear on the reels, the special bonus game is started. The player is then given the chance to smash the shields with the hammer and if that turns out to be the right shield, a jackpot can be won. The current state of the three different jackpots of Hall of Gods is stated at the top of the game. This way you can always check how much money can be won if you are lucky enough to win the jackpot in the bonus game.